Nationalists cooked breakfast on the sacred eternal flame marking the Soviet liberation of Kiev, sparking a scandal in the Ukrainian capital city. Kiev police arrested 32-year-old Anna Donets this past week as a suspect in the protest at the city’s Park of Glory on Dec. 16. Four women gathered that day around the eternal flame that burns before the monument to the Soviet soldiers who died freeing Kiev from the Nazis. Then the women pulled out a pan and demonstratively used it to fry eggs and hot dogs. On Tuesday, the press office of an extreme Christian nationalist party called “The Brotherhood” disseminated a link to a video of the event. The police have reported numerous outraged calls from people who viewed the video. An attempt to defile a monument to military glory and defense of a country evokes an outcry anywhere, of course. But the local situation is more complex. The population of the Ukraine is split between ethnic Ukrainians and Russians, between speakers of Ukrainian and Russian. The monument is to Soviet soldiers, including both nationalities. As interpreted by extreme Ukrainian nationalists, the victory of the Nazis returned Ukrainians to their oppression by Russians. The situation is compounded by the fact that for the countries of the former Soviet Union, as for much of Eastern Europe, World War II is not textbook history, but very much a matter of national pride and a continuing part of life. The war is often mentioned in the news, politicians remember it in their speeches, and it is celebrated ostentatiously on several holidays each year. Veterans are honored and receive special privileges. The monument where the women demonstrated is a special place in Kiev. At its base is the Tomb of the Unknown Soldier. Leading up to it is the Alley of Heroes, lined with the graves of 34 Soviet soldiers. No one is buried in the tomb itself. The women, whose faces are not hidden, came prepared with ingredients and a pan, which they display to the camera. As one of them holds the pan over the flame, police officers who were on duty near the memorial come over to talk to them. Apparently, the women were able to convince them that the action was no big deal. Soon, two more join in, cooking hot dogs on sticks. The Brotherhood has pointed out to the press that Donets was arrested on Josef Stalin’s birthday, Dec. 21, making her “a victim of the spiritual executioner of the Ukrainian people.” According to reports, Donets is accused of violating Article 296 of the Ukrainian criminal code, which outlaws “hooliganism.” She could face three years in prison. The police are still on the lookout for the three other participants. Two of the police officers on duty near the monument have been fired, according to reports, and three others have been subjected to disciplinary measures. Islamabad, Dec 22 (PTI) A military trainer aircraft crashed while on a flight over a mountainous region in southwest Pakistan today, killing the pilot and co-pilot. The Mushak aircraft from the Army Aviation Wing crashed in Muslim Bagh area of Balochistan province, the military said in a statement. “The aircraft crashed due to technical fault,” it said. There were no reports of damage on the ground. The army has formed a team of senior aviation officials to investigate the incident. PESHAWAR: At least 11 soldiers and 24 militants have been killed in clashes near the Afghan border in north-west Pakistan, officials have said. About 150 Taliban launched co-ordinated attacks against five Frontier Corps checkpoints in Mohmand tribal region, they said. The Taliban said only two of their fighters had died. The military has launched offensives in the region in recent months, but insurgent attacks have continued. Amjad Ali Khan, administrator of Mohmand, confirmed that 11 soldiers had been killed following initial reports that three had died. He said 12 other soldiers had been injured. Mr Khan said the Frontier Corps paramilitary troops had “repulsed” the militant attacks in the Baizai area which began at 0200 local time. “The troops responded with artillery fire and raids by helicopter gunships, killing 24 militants,” he said. “Seven of their bodies are in our possession.” He said that the fighting ended later Friday morning. However, Sajjad Mohmand, spokesman for the Taliban in Mohmand, told the BBC that only two insurgents had been killed in the clashes. He said they had captured two soldiers alive and held the bodies of six others. Security officials have rejected the claim, saying no soldiers are unaccounted for. Mohmand is a transit point for insurgents crossing between Pakistan and Afghanistan and a stronghold of the Taliban and al-Qaeda. The BBC’s Aleem Maqbool in Islamabad says militants are proving that they can still carry out attacks, despite the military campaign against them. 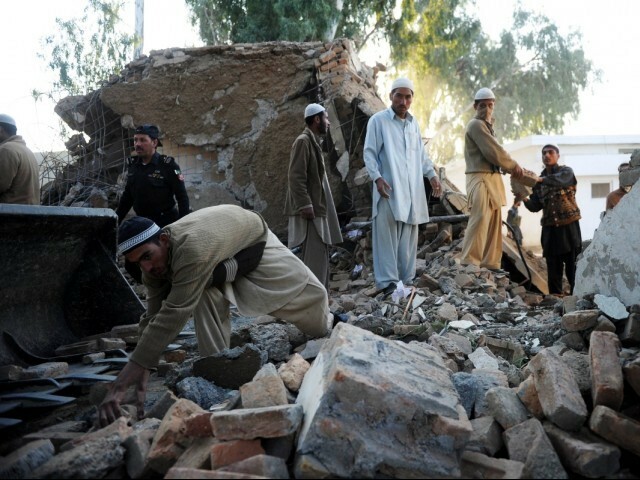 Earlier this month, a twin suicide bomb attack at a government compound in Mohmand’s main town of Ghalanai left 43 people dead. Local officials had been meeting tribal elders to discuss forming an anti-Taliban militia at the time of the blasts. In July, another twin suicide bombing attack, also targeting tribal elders, killed more than 100 people in the village of Yakaghund in Mohmand. Mohmand is one of seven Pakistani tribal areas. Pakistan has faced growing pressure from Washington to launch a major ground offensive in the tribal region of North Waziristan, considered a fortress for militants fighting US-led troops in Afghanistan. Islamabad has denied accusations that it is not doing enough to fight the Taliban in the restive north-west of the country. It says more than 2,400 Pakistani soldiers have been killed fighting Islamist insurgents since 2002. Pakistan supported the Taliban regime in Afghanistan from 1996-2001, but later became an ally of the US when it led an invasion in 2001. Posted in How Do We Build the Resistance?, image of the beast, Organizing resistance, The Most Moral Army In the World?, UnIslamic "Islamists"
PESHAWAR: The leader of a tribal militia in northwest Pakistan, undeterred by a suicide bombing in the area a day earlier, said on Tuesday he was determined to fight off Taliban attempts to seize control of the region. The bombers attacked the office compound of the top government official in the Mohmand region on Monday during a meeting on ways of strengthening the militias, known as lashkars. At least 40 people were killed and 60 wounded. “Listen, we are not going to lay down our arms. We will not let the Taliban re-take control of our land. We will fight them,” vowed Dilawar Adezai, whose 1,200-strong militia is one of those set up to help the government fight militants. Adezai was critical of the level of government support for the militias. “The government doesn’t even pay for the bullets we fire. It’s very sad. Militants are better off than my men because they get arms and ammunition free and their families receive compensation if they get killed,” he said. Cash-strapped Pakistan needs all the help it can get in the fight against al Qaeda-linked militants bent on destabilizing its US-backed government. The army has launched several offensives against militants since last year. But its enemies often melt away when attacked, and suicide bombings persist, scaring away foreign investors needed for the fragile economy. Pakistani authorities have been encouraging Pashtun tribesmen on the Afghan border to revive traditional militias to counter the rising militancy. Under a centuries-old tradition, ethnic Pashtun tribes raise lashkars in their semi-autonomous regions to fight criminal gangs and enforce their tribal codes. The Taliban have hit back by assassinating tribal elders and militiamen and carrying out suicide bombings. “The Pakistani Taliban is very strong and we are not. There is no match. You have seen what they did with those who stood up against the Taliban,” said Aisamuddin Mehsud, a tribal elder in South Waziristan who resisted government pressure to form a lashkar. The stakes are high. Some of the world’s most dangerous militant groups have bases and hideouts in the northwest tribal regions. The United States believes its war on militancy cannot be won unless Pakistan removes them. “You cannot control such a large area for a long time with just soldiers and you have to push residents to take responsibility for the security of their village or town,” said a senior military official in the northwest. Mohammad Ali Haleemzai, who heads one of the tribal “peace” committees that oversee lashkar operations, seems determined to help keep the campaign going. Political analyst Hasan Askari Rizvi said the lashkar had helped the government prevent militants from returning to areas cleared by the military. The militias, armed mostly with AK-47 assault rifles, conduct patrols and carry out raids with the police. But long-term success against militancy requires more than bravery. “You have got to help tribesmen financially and militarily. Their areas need a lot of investments and development and if you don’t, you will lose their support, and that ultimately benefits militants,” said Rizvi. Posted in How Do We Build the Resistance?, Pakistani surrender, UnIslamic "Islamists"